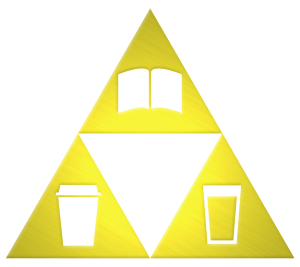 Back in college I had what I called the “Holy Triangle”: the three places I spent the bulk of my day. There was Espresso Royale Coffee, Berkey Hall and a bar called the Peanut Barrel. It was a 30-second walk between each of these places, and I spent my days going back and forth between the three. I would usually start by going to class. If I had my druthers, I would have started with the coffee shop, but I never seemed to get up early enough. So instead I’d stumble into class half-awake, listening to my professor diagram noun phrases in Spanish. Somehow I managed to stay awake long enough to stumble back across Grand River Avenue to get myself a coffee. At Espresso Royale, I would buy a brew and sit on the patio. When it was too cold to sit outside (which it usually was), I would sit in a little enclosed “garage” instead. It was a patio with a full width garage door that they could raise or lower with the weather. It was always open at least a foot, so that the smokers could still legally smoke. Despite the cigarettes, I still liked this little garage, since the ventilation was good enough to keep it from getting stagnant. After working on my homework and chatting with friends (mostly the latter), I would head back across the street for more classes. Sometimes I would have burgers and beers at the Peanut Barrel, though I rarely ever drank before going to class. I can’t say the same for my classmates. I remember this one evening class in Berkey Hall. It was two hours long, with a ten minute break in the middle. Sometimes, on nights when the prof was being particularly dry and boring, some of my classmates would run over to the Peanut Barrel for a round of shots. I couldn’t bring myself to drink in the middle of class, but there were nights when it would have helped. While I couldn’t bring myself to booze it up during a lecture, I wasn’t opposed to knocking a few back after class. This was especially true when the weather was nice. The Peanut Barrel had the best patio in East Lansing, right on the sidewalk of East Lansing’s main drag. It was especially great in the springtime, when all the coeds shed their winter layers. Suddenly, there were beautiful women everywhere, after months of hiding out in the cold Michigan winter. I don’t have a Holy Triangle nowadays, but I wish I did. Still, I like a good coffee house and a good pub to while away my time. There’s nothing I like more in life than an evening on the patio with a some pints and some friends.